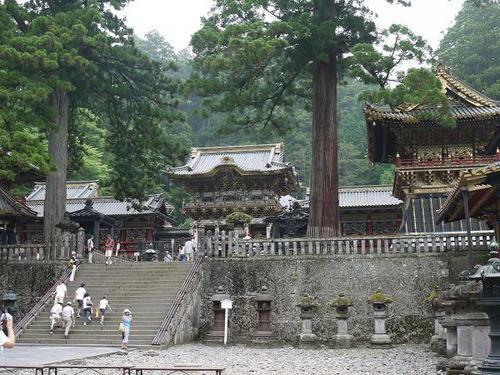 ‘Yomei-mon’ gate is a notable of the wooden structures of ‘Tosho-gu’ shrine in Nikko, Tochigi Prefecture. 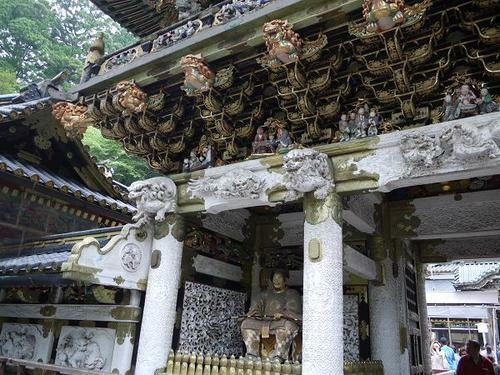 ‘Tosho-gu’ shrine in Nikko, an ideal location for the excursion from Tokyo,saw the groundbreaking ceremony early in the 17th century following the will of ‘Tokugawa Ieyasu’ who was the founder of the longest and the most stable Tokugawa shogunate samurai government. It had come to the completion by the elaborate effort of ‘Tokugawa Iemitsu’, the third shogun, greatly thanks to the variety of generous donations from powerful feudal lords of the nation and some foreign countries. This vast mausoleums are made up of luxurious and splendid structures of wood, which are very rare in the history of Japan. The magnificent structure in the picture is ‘Yomei-mon’ gate designated as a national treasure. There are more than 500 carvings engraved on the gate, being put all the best craftsmanship and ornamentation of those days. As a result it had come to be commonly known by the name of ‘Higurashi-no-mon’ meaning the gate that nobody would get tired of looking at all day long.